Trick or Treating, Games, Music and Fun! Hello everyone! We had a great time in Summer School! Thank you for joining us. It’s that time of year again for us to celebrate Halloween and get spooky! Star Kids International Preschool will hold a Halloween Party full of fun games, good old fashioned trick or treating, and festive singing and dancing on October 27th (Saturday) from 10:00am-12:00pm. So much fun and excitement for just ¥1500 per child and parents can come for free. Star Kid’s Halloween Party is for children of ages 1-10 along with their parents. Younger or older siblings are also welcome. This is a family event so come and have fun together. 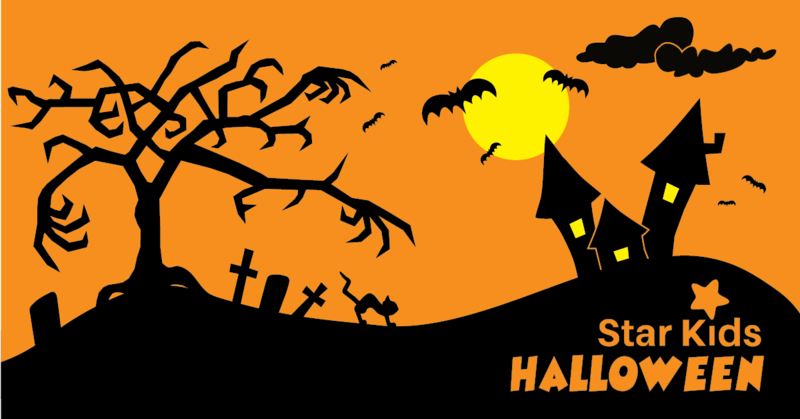 Spooky and silly costumes are encouraged for both the children and the parents! We can’t wait to see what kinds of creatures and characters come to play with us this year! We have limited spots, so it is important to let us know if you will be joining us as soon as possible. To save your family a spot in the event, or if you have any questions, please email us at info@starkids-japan or call us at 03-6452-9470. We’re located at Tokyo, Minato, Shibakoen 2-8-2 Kogai Bldg 2F. Please join us with friends and family for some spooky fun! We hope to see you there and have a Happy Halloween!